I think you can agree that a garage is an often neglected part of the home that can be put to better use with just a little bit of attention – and this article is intended to show you how to organize a garage on a tight budget. It’s quite common for the garage to become a big dumping zone for pretty-much everything, and it’s a very easy target for abuse due to the amount of open space available! If you would like to reclaim your garage, declutter your garage, and generally organize your garage, this article is for you. I will lay out a few tips for approaching your garage cleanup project, as well as some budget-friendly ideas that you can use to help turn your garage into something you can take pride in. Be sure to stay tuned at the end for a couple of helpful bonus videos! Before you get into the details, such as organizational items like shelving, cabinets etc., it’s wise to look at the bigger picture first. First, take everything out. It’s hard to organize your garage if you don’t take stock of everything you have first – so the first thing you should do is take everything out. Then clean the garage. Give it a good sweep, and a good overall cleaning. You don’t want to put everything back later into a dirty garage right?! If broken, can it be repaired? Or, should it be repaired? Do I love it, and can’t part with it? If I gave this away, is it in usable and “safe to use” condition? This stage is one that will make a huge long-term impact, so take some time to do this judiciously. It’s a great feeling to declutter a space, and the odds are that you won’t miss most of the stuff that just sits there collecting dust anyway. 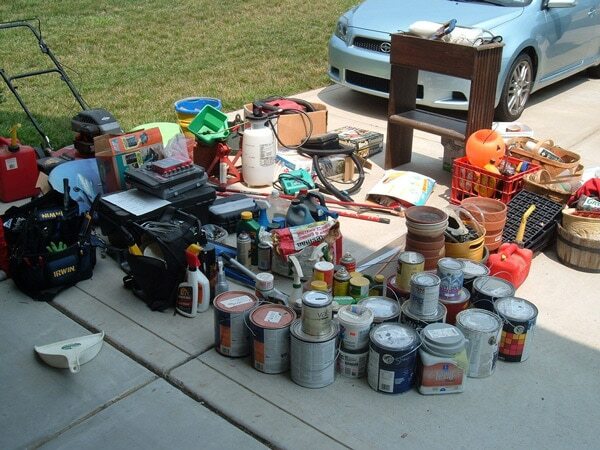 Do be sure to dispose of hazardous materials like paint, solvents, and batteries, safely and properly. Once you’ve sorted your three piles (trash, donate, and keep), you now need to decide how to deal with the keep pile. For example, you wouldn’t put a screwdriver together with your gardening items. Hand tools like screwdrivers, hammers, etc. 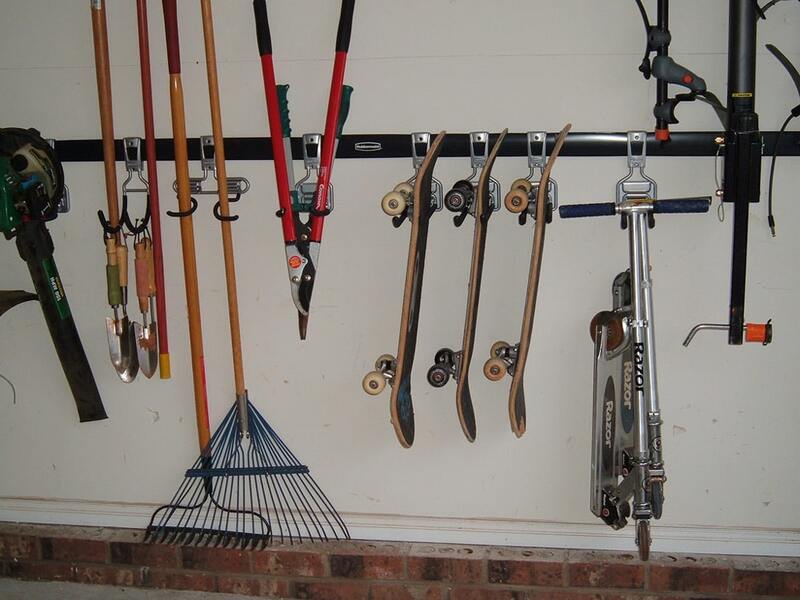 would go together in one area of the garage, while all your gardening tools would go in another area. With this approach, you would have a “garage zoning” system which will make it easy for you to know what goes where. That brings us to the next concept, which is “everything has a place.” In short, there should be a place for everything so you never have to wonder where to find it when you need it, or where to put it when you’re done with it. When you use an item from your garage, if you don’t know where it should go then you probably will just put it anywhere, which will start to create a mess all over again. To remedy this, you need to have a place for everything. Your tools should have a toolbox, or perhaps a spot on your pegboard wall. Your garden rake or shovel, should have a hook to hang on the wall. Your cleaning supplies and other liquids should have a shelf or cabinet to go into. To finish the idea up, I personally feel it’s a spectacular idea to label everything. If you have a bin for ¼” screws, then you’ll know exactly where to find and place them when needed. No guesswork, excuses, or messing around. Keep items off the floor. Think vertical. Use your walls, and even your ceiling. For starters, this will force you to see your garage differently. It’s very tempting to see a large open space just begging to get messy, so you set something down with the intention of dealing with it later. Then of course, you don’t – and after this happens several more times, before you know it you have a cluttered garage again. Not only that, but keeping items off the floor will also help protect the items as well. For example, from insects, or if your garage ever experiences any flooding issues then the items kept off the floor will be better protected. In order to keep things off the floor however, you’ll need to get creative with the other planes of your garage, your walls and ceiling. Having the proper hardware and equipment to do this is essential. You can build a lot of this yourself if you are a DIY superstar. But for most folks, there’s some reasonably priced options that you can just purchase. It really is possible to organize a garage on tight budget, but sometimes it could require just a little bit of creative planning. A lot of garage organization can even be built yourself if you’re a hands-on DIY kind of person – you can find a lot of great ideas out there on Pinterest for example. But if you’re just looking for a quick and easy solution, there’s also a lot of great accessories that you can purchase right away that can instantly handle whatever organization problem you might have. 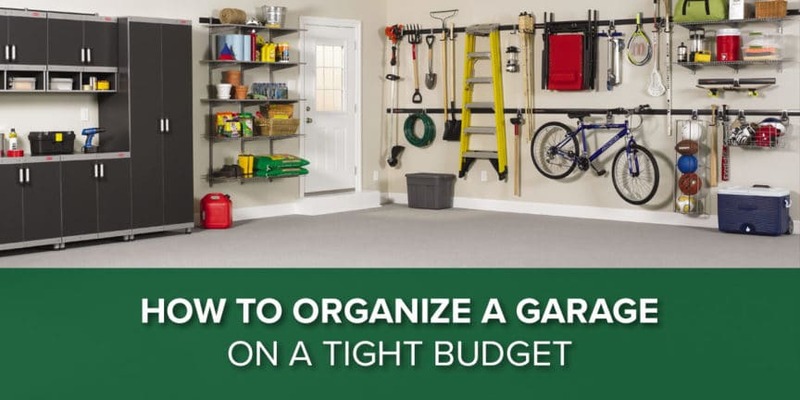 We sincerely hope we have answered the question ‘How to Organize a Garage on a Tight Budget” but let us know if you think there’s anything we missed! 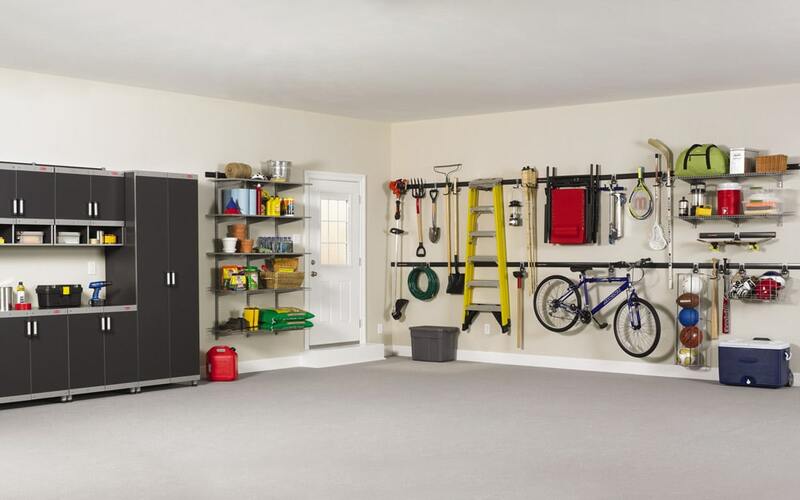 Please share with any friends that you think would enjoy some helpful ideas on organizing their garage. Here are a couple of bonus videos for the DIY folks out there! Going to do some of these immediately!!! !